I have been able to obtain very high resolution MOLA (Mars Orbiter Laser Altimeter) MEDGRs (Mission Experiment Gridded Data Records) — gotta love those NASA acronymns — and I have used those to create a new set of Mars maps. The older maps are also still available for those who would prefer them. 1) I have modified my color correction to be a more realistic and less orangey - Mars is bluish basalt rock covered with pink-red sand. 2) I have extensively retouched the color image to remove most of the crater lighting. 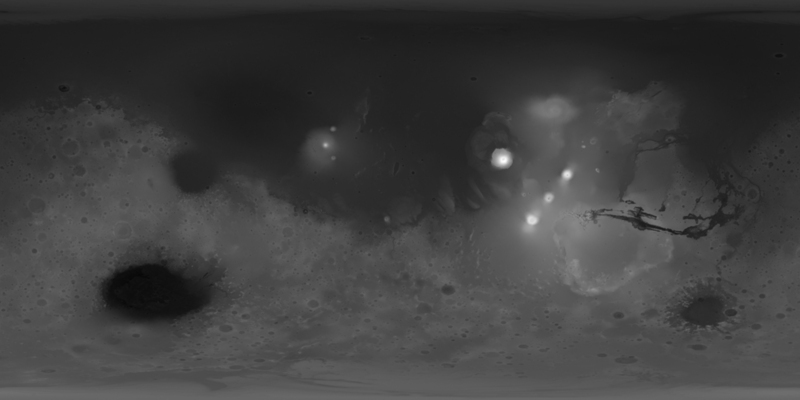 If you look carefully at my original Mars map, the lighting on the craters (which interfers with proper bump-map lighting) comes from all different directions. Also, as many have pointed out, the color position of the craters didn't line up well with the bump-map information, so there was a troubling double image effect, particularly in the southern hemisphere. I have moved features around, and painted out the highlight and shadow on many craters, and then used the MEDGR information to create new crater detail that exactly lines up with the bump-map information. 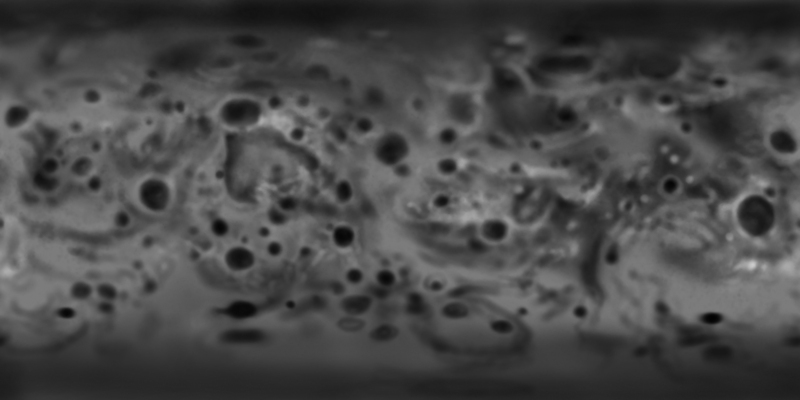 3) I am also now providing the bump-map both in a standard grey-scale, and also in the new RGB normal map format. Rendering the planet with the normal map instead of the old bump map reveals dramatically realistic shading and surface detail. Finally, these maps are offered in higher resolution than the old maps. In addition to the 6k map previously offered, I now have 10k and 12k versions. The 1K versions of these images are free. Bandwidth costs force me to charge a nominal fee for the hi-resolution versions (2K, 4K and 6K). Please note: When you get to the end of the PayPal process there will be a "Continue" button on the lower right side of the screen. When you click the "Continue" button you will be brought to the page on this site where you can download the larger image maps. The big differerence between this map and the one below, aside from the color correction, is that I have extensively retouched the map to remove the lighting cues from the craters, and then generated new detail from the height information in the topology map. This map now lines up with the normal and topology maps perfectly. Although it is difficult to see here in the thumbnail image, this normal map of the martian topology encodes a staggering amount of surface detail that results in incredibly realistic lighting compared to the older bump map method. If your rendering program supports the use of normal maps, I highly suggest using this instead of the bump map below. Tip: the best results in Cinema 4D come from setting the Strength of the normal map effect to 200%. Click here to see the difference between bump mapping and normal mapping. 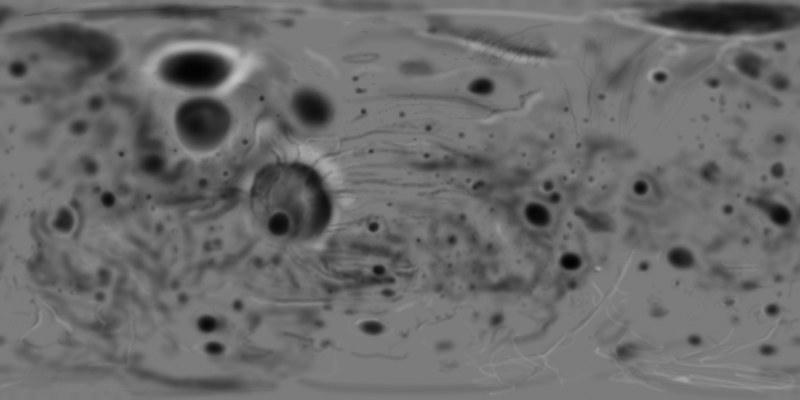 Normalized 8bit greyscale topology map derived from the original 16bit source. If your rendering program supports normal maps, use the map above instead. This map is also useful as a deformation map, in case you want to recreate the true geometry of Mars. 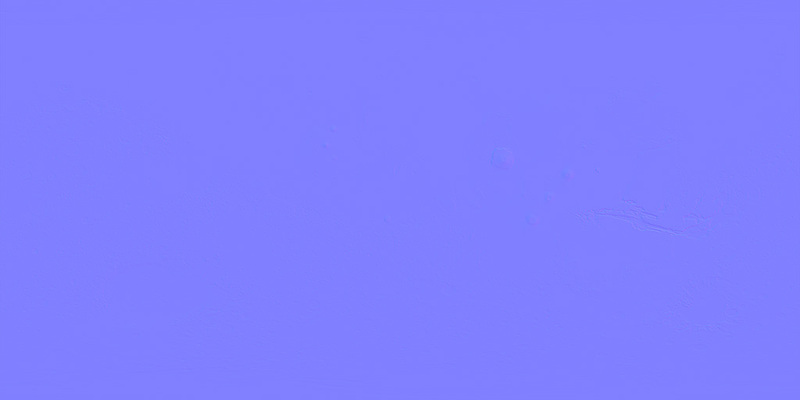 Obtained from this page, I combined the color channel images, scaled them down, and provided a color correction to remove an odd blue-green cast from the image. 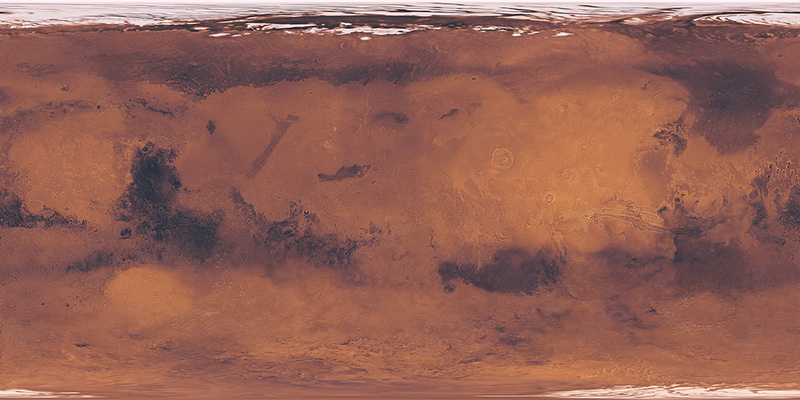 This is darker, moodier, and more saturated looking than previous mars maps, but I think you agree, the amount of detail in the map is staggering. 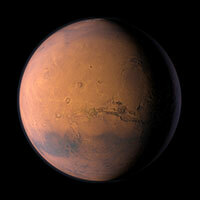 Topographic map of Mars derived from data found at this site. This will provide a very rich, detailed, and accurate rendering of all of Mars' mountains, valleys and craters. Phobos and Deimos are aspherical moons of Mars, which means you cannot simply slap a map on a sphere and expect to get a reasonable representation of either of them. I prevailed upon Raul Alvarez of the Open Universe project to supply me with his 3D object files of these bodies. I ran his files through a polygon reduction filter, and then hand painted bump maps in order to replicate the surface features of these moons. 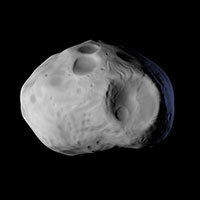 Of the two, Phobos is the most interesting, with a rather pronounced impact crator on one side and considerable stress fractures radiating from it. 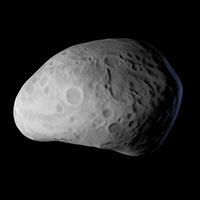 Deimos on the other hand is your basic space rock. I took liberties with both bodies, paying attention to the large scale features but improvising a lot of small cratering and surface effects for the sake of keeping the texture interesting. Maxon's Body Paint program is an amazing way to paint directly on 3D objects in real time. Hand painted bump maps, 1200 x 600 in size. These are designed for spherical projection onto the model files available below. Wavefront object files (which can be opened in Lightwave and Cinema 4D, among other programs) of these moons. I used these reduced polygon models in conjunction with Cinema 4D's hypernurbs feature to produce smooth 3D objects onto which I could project the bump maps and other surface effects. These files have been compressed with the ZIP compression scheme, so you will need to locate an appropriate unZIP program for your platform in order to use these files.